The first stone theatre of country opened in Sopron in 1769. A regular theatrical scene in Sopron exists since the 1730’s. Hungary’s second permanent theatre was built here in 1769. At that time the language spoken in Sopron was mainly German and the theatre had its directors and actors recruited from Vienna. The first Hungarian speaking drama brought to the scene was László Hunyadi in 1792. In the 1830’s the magistrates of the town decided to publish a call for competition in respect of a new theatre building. The winner was an Austrian architect named Franz Lössl, who designed a harmonious classicist building, the construction of which was completed by 1842. This date meant the beginning of the age of permanent companies in the theatre. From 1905 onwards the six months long season has been dedicated to Hungarian performances. 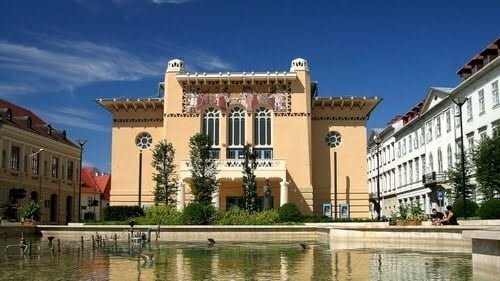 In 1909 the theatre was renovated and modernised; it was at that time that the facade of the building gained an Art Nouveau style decoration with folklore motives and the interior structure and engineering, the acoustics and the illumination was fully streamlined. During the communist era, the theatre was of course nationalised and this resulted in an eventless period in its history. Finally, in 1991 the theatre became independent and was again renovated. The theatre came to life again in 1992 and has held performances since then. There are six to eight premières annually on the main stage of the Petőfi Theatre including the genres of popular, musical and drama performances. Address: 9400 Sopron, Liszt F. u. 1.